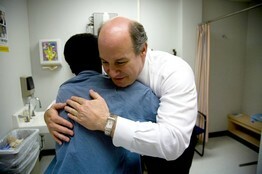 The New York Times asks, "Should the Doctor Hold a Patient's Hand" during emotional times or if the patient is crying. The comments that follow the short article are the most interesting. Most readers say this question shouldn't even be asked and that human compassion should always win out. Touch is a human gesture of comfort and understanding. But some readers disagree. One said she recoiled when the doctor reached out to touch her hand after telling her that her cancer had returned. It felt really creepy to her. Another asked, "What if the physician is also a Catholic Priest or a pediatrician and a Priest." Whoa, it becomes more complex when you get into the psyche of the abused. I have often thought that one of the appeals of chiropractors is that they "lay on hands" and touch and manipulate patients. With 21st century modern medicine, physicians can treat entire episodes of illness with tests, scans and robots and never actually touch the patient. No wonder people feel "dehumanized" and wonder if doctors really care. Touch and compassion are part of the entire human experience and the physician is present during a patient's most stressful time. I know a physician who is absolutely wonderful. 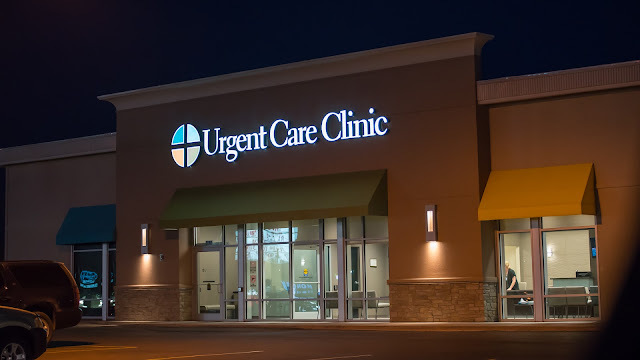 He is warm and compassionate and provides excellent care. One of his patients filed a complaint with the medical staff because he hugged her and she felt it was inappropriate. She believed he had crossed the professional line by hugging. Here is a physician who genuinely cares and spontaneously hugged a patient and she complained that it was intrusive and even went so far as to call for an official investigation. It was devastating for him. None of us can read minds. The best we can do is look for non-verbal cues from patients and try to respond based on intuition. I guess that is the "art" of medicine. What do you think? Should physicians hold a patient's hand or offer a hug? 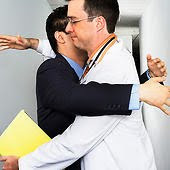 I would very much appreciate a hug from my doctor, but since some do not, maybe the doctor could say something like, "May I hug you?" I guess some might also feel that could be inappropriate; however, compassion, especially in dealing with serious illness and disease, is a way to reach out to support the patient in his or her medical crisis. Thanks for starting this important conversation! I have appreciated hand squeezes from doctors. I am not sure if I would like hugs. A pat on the shoulder is fine. "May I hug you?" seems that the Doc may need the hug. How about "Do you need a hug?" said to the patient. This is a good topic to bring up. I think it has to do with the doctor-patient connection and bond in their relationship and the reason or situation for it. Having experienced a hug from both my surgeon and my internist at different times in certain occasions it was the right thing to do and left me with a good feeling. I appreciate that both of them are open and confident enough to show the warmth they have. Everyone was the same gender and completely comfortable situations. Maybe because of knowing them and having had good relationships with both it wasn't uncomfortable. It seems like the doctor has to also have a trust in the patient as well as the patient trusting in the doctor. On the other side of it would a physician be uncomfortable if a patient hugged them if it was for an appropriate reason? I observed this happen from a few patients towards their long time doctor retiring on the last time they saw each other in the office. Some said it was like losing a family member or even a closer relationship then that and there were strong close emotions. Then there are always some that are indifferent more cooler business like relationships where it would awkward where hugs would not enter in. It seems like the doctor would know best, based on his/her relationship with their patient. Sometimes it may seem appropriate while other times, it wouldn't. This is one of those questions with no absolute right answers. Many doctors that I've observed seem to be well equipped in handling this subject and can "read' the patient for those subtle clues that you mention. If the news is particularly devastating, many physicians will ask a social worker, nurse or member of the clergy to join in the conversation. This way if the patient needs that physical touch, they can choose from at least 2 people, which always makes people feel more comfortable. that pic has to be the most awkward hug in history!! Doc if you're so inspired, can you do a post on H1N1 this year? If we were vaccinated last year why should we be again? Yet how can we get a regular seasonal flu shot without being double dosed on H1N1? I was alone in the emergency department after overdosing on Tylenol and the hospitalist came in to tell me he was admitting me. I was scared; I didn't know what was in front of me- my emotions were reeling and I was very despairing. The doctor squeezed my toe on his way out and I cannot tell you how comforting that was. I distinctly remember that reassuring feeling even though it was five years ago. If there is ever a question about a hug or holding a hand, please, just ask "would you like a hug?" Anon 8:06 PM; Thanks for sharing that valuable comment. I hope things are better for you now. Best wishes. We see a lot of pediatricians/pediatric specialists for my daughter's chronic disease, and across the board they seem to have a good system for this - sort of a verbal hug. During stressful or confusing times, they will say something about a hug. Different doctors say different things, but the sentiment is there without physical contact and I always appreciate it. It lets me know they understand what I am going through. I recently saw Michael Douglas on the David Letterman show talking about his throat cancer diagnosis. At the end of the interview, David Letterman asked if there was anything he could do - and Michael Douglas said "Yeah - you could give me a hug" He did just that and it was very heartwarming. (and I REALLY don't like Letterman) but I liked him at that moment! I think a hug here and there is okay. Where do I 'click' this on my new EMR system? My immediate reaction to this is no. I have my family and friends for a hug when I need one, and this why often family members are brought in, for this more physical support. I would prefer to keep my relationship with my doctor non-physical. And like the other anonymous, I received a hand hug (in a very similar situation) and that was such a comfort. And conveyed much more than a few words of support. Convinced me to say, and may have saved my life. Two strong opinions from the one person. Each person is different, and each situation is also different. So I think - go with your gut, and hopefully you'll be right. After the unexpected death of someone I was very close to and seeing my doctor for a health problem soon after she patted me on the shoulder when leaving which was comforting and supportive. i truly believe in "The healing power of the Physican's touch". My dear Internest has hugged me several times and it means so much to me, particularly since i am in a "bad" place emotionally. He knows of my problems, (having been the one to remove staples several times!) and senses how much touch means to me. Anon #1 My best wishes to you. 29 years ago today I went to the doctor with what had been diagnosed 2 days prior by another doctor as bronchitis. I knew otherwise. Turns out I had postpartum cardiomyopathy and was in severe congestive heart failure. The doctor I had never met sat on the table next to me and was kind and gentle and held me while I cried when he told me I had to stop breastfeeding my 2 1/2 week old baby because of meds and go immediately to the hospital where I might die. I have never forgotten that human touch. When it comes to the name Aldactone, you must be aware of the fact that acne and spironolactone are deeply interlinked. Yes, aldactone drug is a trade name of spironolactone. Spironolactone drug is a synthetic lactone drug and is used for the major treatment of heart failure, liver disease, and hypertension and last but not the least acne as a whole. Efeective spironolactone treatment can be given to those who are suffering from polycystic ovarian syndrome. Do you suffer from allergies every now and then? If yes, then buy Claritin because this medicine is helpful in treating allergies without causing drowsiness or sleeping. This is an over the counter medication which is an effective antihistamine that blocks the action of allergic reactions successfully. In claritin there is a drug namely loratadine. And that’s why this medication is popularly known as loratadine Claritin. There is one more medication which is as effective as claritin and that is alavert. Both alavert claritin have good effects to treat allergy in patients.